A promissory note or IOU is a signed promise to pay a sum of money (debt or loan) under specific terms and amount of time. Personal: generally used in loans between family and friends. Commercial: used by financial institutions, commercial lenders, banks. Real Estate: used when a lien would be placed (home, commercial property). Investments: generally used to raise business capital, it has legal value and can be traded. Recovering damages and returns on investments are usually expected. Name and address of the LENDER or Holder, Bearer, Creditor, Payee, Obligee, Promisee, Seller, Service Provider. Name and address of the BORROWER or Maker, Debtor, Promisor, Payer, Obligor, Endorser, Buyer, Customer. Date when the note was made. Place where the note was made. Place where payment must be made (and time if necessary). Interest rate, penalties and late fees to be charged (if any). If it is a secured document, include the description of the goods. Why Should You Write A Promissory/IOU Note? Clarifies the expectations of the parties, terms of the loan and repayment schedule, options & obligations, the interest rate, late fees, grace period, where the payments should be made, etc. A debt, tax or legal counsel should be consulted before signing any legal document to be used in a consumer credit transaction. It is always a good idea having a local attorney review your note to make sure it complies with state laws and can be held valid by a court of law. This SAMPLE PROMISSORY/IOU NOTE is a simple template that can be modified to fit your specific needs. This document is Copyrighted and is intended for personal use ONLY. FOR VALUE RECEIVED, I, ___________________________________ (Borrower) promise to pay _______________________________ ___ (Lender) the sum of _____________________________ Dollars ($_______________), and interest at the yearly rate of _____% on the unpaid balance as specified below. Repayment shall be made in __________ weekly/monthly installments, consisting of $______per installment on the ____ day of each week/month and continue through for ______ week/months, or until the principal is paid in full. OR, Borrower will pay one lump payment in lawful money of the United States on: _____/_____/_____. If the Borrower fails to make an installment payment when due or fails to comply with any other term of this promissory note, the loan will be considered in default. A late penalty charge of __________________ Dollars per (month/day) will be assessed until the account is brought current inclusive of the late charges, interest and applicable fees. Payments will be applied first to interest and then to principal. This note may be prepaid by the Borrower at any time in whole or in part without premium or penalty. In the event of the Borrower's death, the unpaid indebtedness remaining on the note shall be canceled. The Borrower must promptly inform the Lender of any change in name or address. If the Lender prevails in a lawsuit to collect on this note, Borrower will pay Lender's court costs, collection agency costs, and attorney's fees in an amount the court finds to be reasonable. IN WITNESS WHEREOF, I set my hand under seal this ____th day of _______________, 20___ and I acknowledge receipt of a completed copy of this instrument. borrower fails to do so. When signed and agreed upon, the lender has legal authority to seek collection or restitution against the borrower for the amount of money loaned, plus interest and legal expenses in most cases. By signing a note, the borrower agrees to repay the loan that is guaranteed using the note, but it is not an assurance that the lender you will get his money back. It is used for simple loan transactions and effective as long as both parties fully understand what they are getting into. Make sure any document you find online complies with your state's laws prior to executing it for business or personal use. If your case involves more complex issues, the assistance of a licensed legal professional is recommended before drafting and signing anything. Enforcing a SECURED PROMISSORY/IOU NOTE can be accomplished by taking possession of the secured item, or hiring a re-possession company to do that for you. The enforcement of an UNSECURED PROMISSORY/IOU NOTE is more complicated for being only a breach of contract on a promise to pay. First, take legal action by filing a petition in a court of law and get a judgement in your favor. Then, hire a collection services agency and initiate repossession proceedings against the borrower. If it fails, you can also seek to garnish the person’s wages. If all fail, try selling the note to a specialized company which will then attempt to collect the transferred debt. When drafting your note, please make sure it complies with your state/jurisdiction USURY LAWS. These laws define the maximum interest rate you are allowed to charge. Violating usury laws can have serious civil and sometimes criminal consequences. Also, your state may have limits which apply to the amount you can charge for late fees. Return from Promissory Note to Home page for Online credit card, financial and debt help. Chapter seven, Chapter eleven and chapter thirteen bankruptcy assistance. DISCLAIMER: The law will vary depending on your state and the specifics of your case. 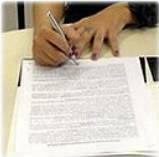 The information provided by USAttorneyLegalServices.com - Free Promissory Letter - is intended for educational purposes only. All the content on this website should NOT be considered professional legal advice or a substitute for professional legal advice. For such services, we recommend getting a free initial consultation by a licensed Attorney in your state. Copyright © 2005-2018 USAttorneyLegalServices.com - All Rights Reserved.